The iPad 2 international launch is still right on schedule. There are currently no delays but we will see limited stock everywhere. 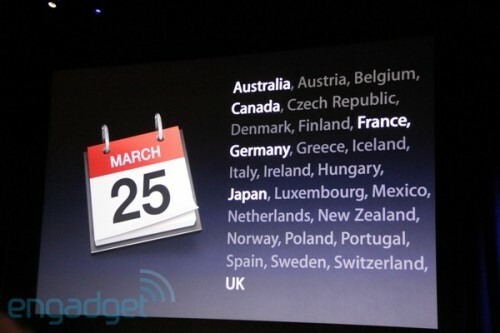 The iPad 2 will go on sale this Friday in 25 more countries. Same as the US launch, the iPad 2 will go on sale at 5:00PM local time March 25th and online at apple.com at 1:00AM. iPad 2 with Wi-Fi will be available in Australia, Austria, Belgium, Canada, Czech Republic, Denmark, Finland, France, Germany, Greece, Hungary, Iceland, Ireland, Italy, Luxembourg, Mexico, Netherlands, New Zealand, Norway, Poland, Portugal, Spain, Sweden, Switzerland and the UK on March 25 for a suggested retail price of $499 (US) for the 16GB model, $599 (US) for the 32GB model, $699 (US) the 64GB model. iPad 2 with Wi-Fi + 3G will be available for a suggested retail price of $629 (US) for the 16GB model, $729 (US) for the 32GB model and $829 (US) for the 64GB model. iPad 2 will be available in Hong Kong, Korea, Singapore and additional countries in April, and in many more countries around the world in the coming months. Further international availability and pricing will be announced at a later date. If you want to get an iPad 2 right away be prepared to pay over retail or go camp out at the store many hours in advance.